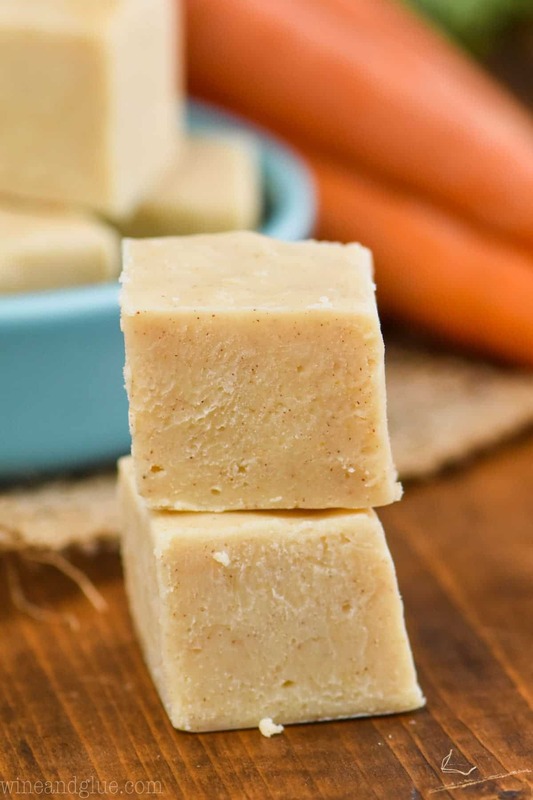 This Carrot Cake Fudge is only five ingredients and tastes just like my homemade Carrot Cake! 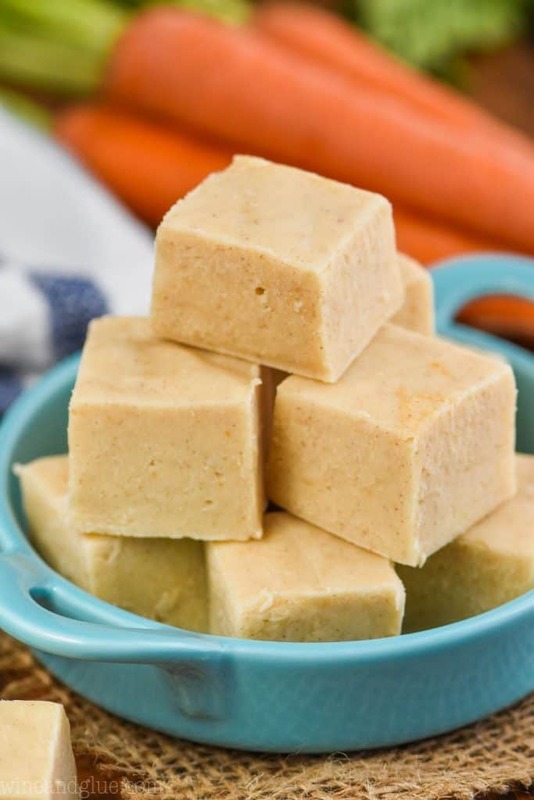 You will love the secret ingredient that makes this easy fudge recipe taste like carrot cake. Happy Sunday! I’m not sure why carrots became an Easter flavor . . . I mean, I guess I get it. Easter . . . . rabbits . . . carrots? Is that the logic path we are following? Either way, with so many carrot cake lovers in my life, I’m glad I have a few recipes that fill that carroty void. 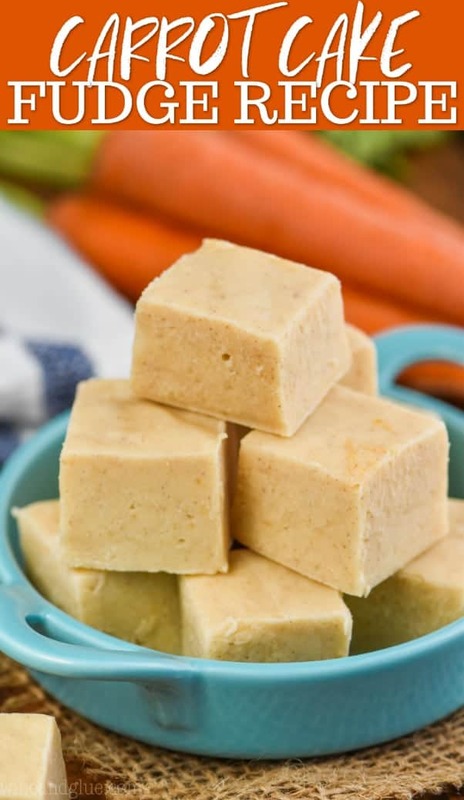 Last week I published my homemade Carrot Cake recipe and now today I have for you those great flavors in fudge form! P.S. 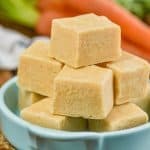 Some of my most popular recipes are fudge! Check out photos of them below the recipe! When you make fudge with white chocolate chips and sweetened condensed milk, you have to be really careful what you add because liquidy ingredients can really mess with the consistency of the fudge. Your white chocolate can seize and you don’t get the smooth consistency you are looking for. Generally speaking, you want three cups of chocolate chips to one 14 ounce container of sweetened condensed milk. From there you can add extract, different seasonings and flavors to make different fudge. 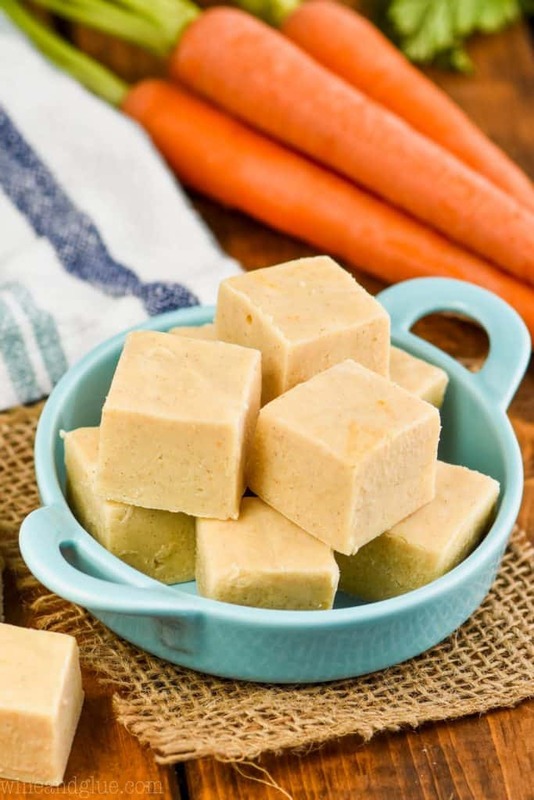 In this Carrot Cake Fudge recipe, I wanted to make it carrot flavored without adding actual chunks of carrot as you do in the cake version. So, I had the genius idea to add carrot baby food! From there, I upped the amount of white chocolate so as to not mess too much with the consistency. It worked like a charm! Please note that when you melt the white chocolate and the sweetened condensed milk together it will have a very chunky consistency. That’s because it is more chocolate than the regular ratio (spoken about above) likes. But once you add that purred carrot, you will end up with a nice smooth consistency. There is a video below so you can see this process in action! After I figured out that a little carrot baby food mixed with the right amount of sweetened condensed milk and chocolate chips works perfectly, I knew I needed a few more ingredients to get the taste just right. The last two ingredients were a little nutmeg and cinnamon. The result was a fudge that doesn’t taste super carroty, but does taste a whole lot like your favorite carrot cake. 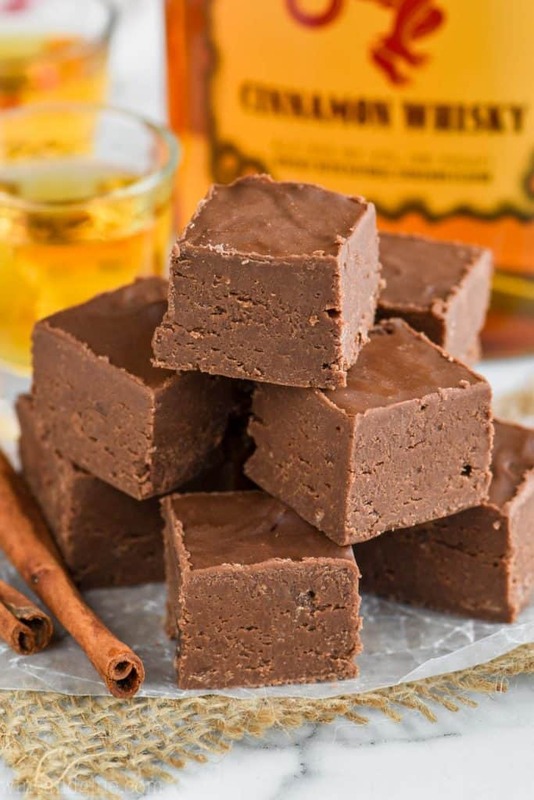 This fudge truly is a simple recipe with just a few easy ingredients. It’s preparation time is only about 10 minutes with simple to follow steps. 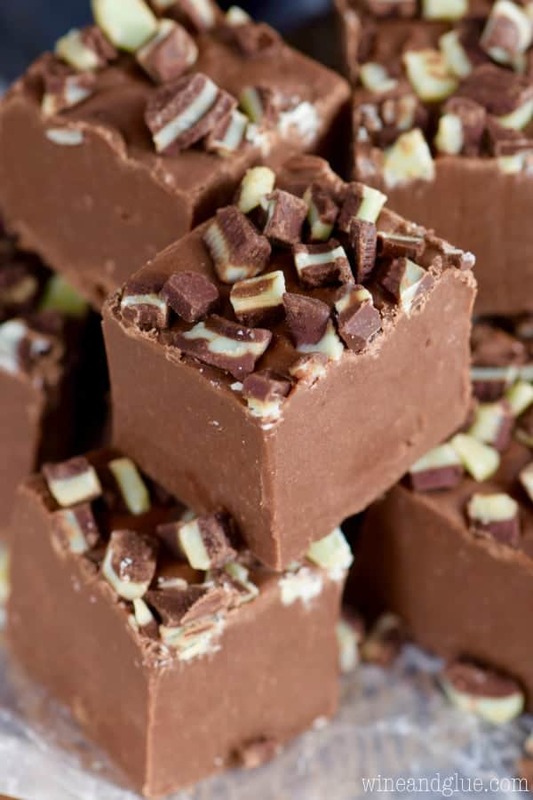 If you love this great way of making fudge with white chocolate chips and sweetened condensed milk, check out some of my other recipes! And if that is not enough check out these 25 EASY FUDGE RECIPES! Line an 8x8 pan with aluminum foil and set aside. Melt the white chocolate chips and sweetened condensed milk together over medium heat until smooth and combined, stirring often. Alternatively, melt in the microwave. Microwave for 1 minute at half power, stir well, and then continue to microwave at 30 second intervals stirring very well until just combined. Stir in the carrot baby food, cinnamon, and nutmeg. Pour into the aluminum foil lined pan. Refrigerate at least four hours to set. Cut and serve. Baby food into fudge…genius! I loved rearranging my room as a kid, but like you, it didn’t go very far because of that damn waterbed! Thanks for the chuckle over the thought of those things! 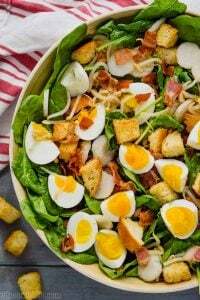 Pinning this to share at Easter brunch! Two things, thanks for not being grossed out at the baby food! Ha! I was worried with this one! And two, waterbeds! Hilarious! Glad I’m not the only weird kid who had one . . . what was so enticing about a headboard with compartments . . . ? Lol!!! So glad I wasn’t the only one Sarah! I have had carrot cake fudge on my list forever! I made some last year and it so didn’t work. It’s still on the drawing board for this year. I love that you used baby food!! Genius. I can’t wait to see your recipe Dorothy!! You are the master of fudge making! I love all of your creative fudge ideas! Wowzers! 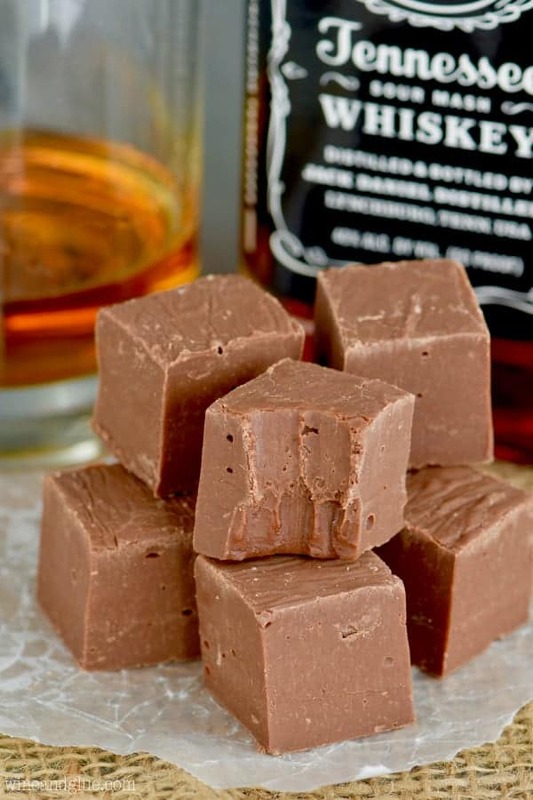 I totally want some of this fudge!! What a great idea, these look so good! Have pinned to my fudge board! Thanks!! I hope you like it! Found you @ lady behind the curtain linky party. I love the idea of a “healthier” fudge. Cannot wait to try. Pinning it, okay? We really hate white chocolate, any other ingredient we could use instead? This looked really good until I saw that. I’m not sure what to tell you, Mary. With four cups of white chocolate, it’s going to be hard to find a substitute that will work. You can try milk chocolate, but it’s going to be a very different flavor combination. 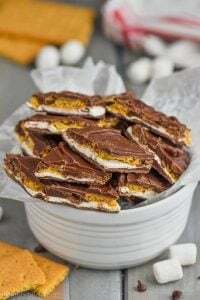 You could also try candy melts from Wilton. They are vanilla flavored, and you might like them more. I have found, that sometimes with my recipes, people who think they don’t like white chocolate, do enjoy it in a different form. A waterbed!? I never knew! Well that’s fun! 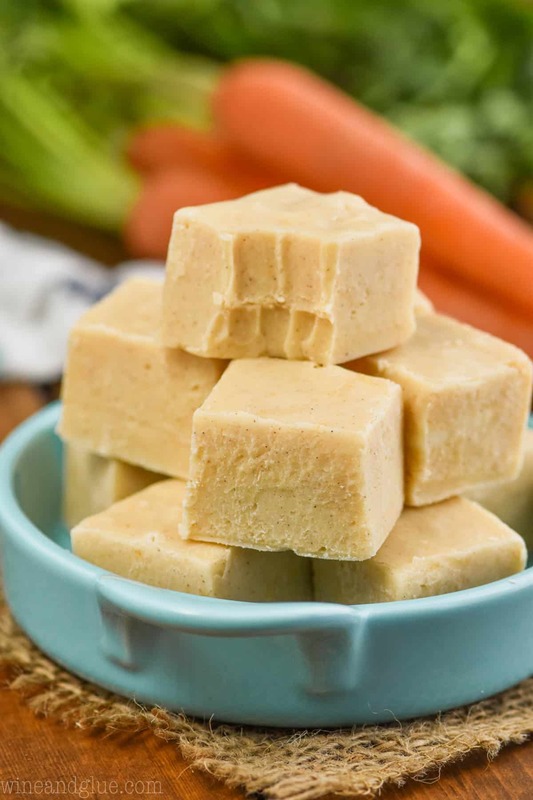 And so is this fudge…made with baby food! Love it! How fun would it be after the babies are born to play a game of “I never knew” together?? I made this fudge over the weekend and it tastes amazing. The only problem I had was that the top of the fudge set but the bottom stayed kind of squidgy. Any ideas why? Hi Jenn! Sorry the recipe didn’t work out quite right for you! Without being there it’s hard to know what went wrong, though I would suspect that your ratio of liquids (the baby food and sweetened condensed milk) to solids (the white chocolate) was a little off. When I was doing recipe development on this, the first batch had the PERFECT taste, but the fudge never set. So I had to lessen the liquids and up the chocolate. And I’m assuming that you let it set in the refrigerator at least four hours? I left mine overnight. I hope that helps! 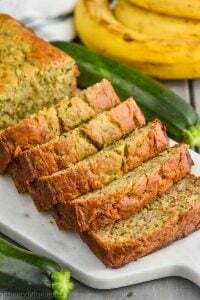 Thank you for the recipe, it looks delish! I’ve pinned it for safe keeping. I made carrot cake fudge and it was awesome. I gave it to friends for mothers day. Thanks for sharring. Thanks Aida! I’m so glad you liked it! Does white chocolate chips melt the same as chocolate chips? Since I seen you used baby food I was thinking of what other baby food you could use and then wondered about the chocolate chips. 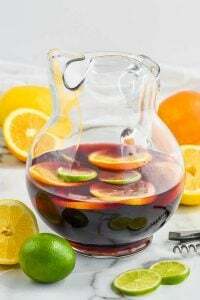 Going to try this recipe and see who likes it at church. It doesn’t. White chocolate morsels are a lot more picky about what you do to it than chocolate. I used Gerber brand and it worked perfectly, but any more than the amount listed and it might make the chocolate seize up. It’s also key that you fully incorporate the sweetened condensed milk before adding the baby food.